We’re not here to just show that yes, there are green ways to save money, we’re here to also show you how to go green and get the maximum financial reward for it! Here are 25 easy tips to help you go green and save money at the same time. Learn more about how to reduce your impact on the environment and save money by living frugally! 14. Are Dryers Really Necessary? 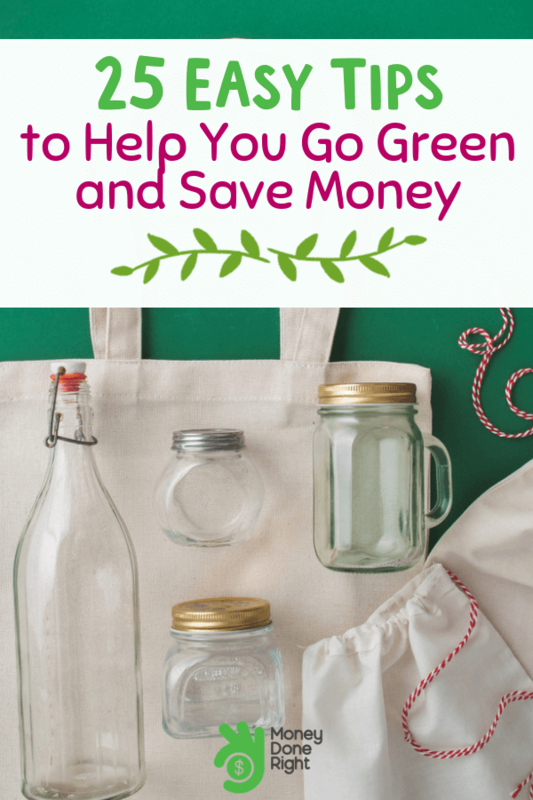 Green Ways to Save Money: Get Started Today! This is at the top of our list because it seems common sense and basic information but sadly, not enough people apply it. When your phone hits 100% unplug it from the charger. If you leave a room, turn off the lights and TV. These are just a couple of pretty basic things that won’t take any effort or thought. Yet very few people do them. It might take a few days to get using to doing them but once you do, they won’t require any effort. The power you save through these acts will help the environment and reflect on your electricity bill in a positive way, too. Some might find this surprising, but going digital is good for the environment. Instead of printing all of your photos and documents, store them on a hard drive. You can also opt for email subscriptions and electronic invoices instead of receiving your updates by mail. We know how much the smell and feel of paper means to everyone, but maybe give Kindles and e-readers a shot. These all fall under eco friendly living and will likely save you a few dollars in the process. Arcadia Power is an app that’ll send you an alert when an expensive power plant switches on nearby so you can cut back on your energy consumption. It actually gets better because the app will pay you to do just that. Arcadia Power will reward you with money and the chance to win prizes by using clean energy and not dirty energy. What are you waiting for? Start receiving your reward for helping the environment with Arcadia Power now! Nest is the ultimate home app. It allows you to control your house’s thermostat, manage alarms, and see how much energy you’ve been consuming — all of that from your phone. You can use the app to adjust your energy consumption and even program your thermostat into an energy-conserving mode. Sign up for Nest to make managing your home so much easier and save money in the process! While Stash isn’t an app that has a direct impact on the environment, it can still help a lot. Stash is an easy-to-use investment app that can help you invest your money in eco-friendly companies doing their best to save the world. You don’t need to pick a specific company. Just tell Stash what causes you are interested in and it will do the rest! Sign up for Stash using this link to get a $5 bonus and start investing into the future of our planet! The name of the app is quite fitting because it’s one of the best ways to go green and save money. Just register your home with Arcadia Power and the app will make sure your house uses renewable clean energy. This is one of the best green ways to save money because you won’t need to pay anything when signing up. Have an impact on the environment with the help of Arcadia Power! Eco friendly money saving tips can have other benefits too. While taking case of the environment you can also take care of your health. By cycling or walking to nearby places instead of driving or calling a cab you’ll be doing the environment and your body plenty of good. And with apps such as HealthyWage, you can exercise, lose weight, and make some money. Sign up for HealthyWage today to start losing weight and getting paid for meeting your fitness goals! These include regular paper, toilet paper, and printing paper and they’re just as good as virgin paper. This is just one example of how going green saves money for business too, since businesses and work places consume more paper than anyone else. If you have a yard or an extension in your house where that’s possible then go for it. At first it might not make much sense because how is that helping you save money? The trees will bring in more shade and absorb the carbon dioxide around your house making it cooler. This way you won’t need to use your AC as much, and certainly not at as much power. When we spill something in our homes it’s so much easier to pick up some tissue or paper towels to clean the mess. Alternatively, you could buy a couple of cheap towels for that purpose or use your worn-out towels that you would’ve thrown away. You can later clean these rags and reuse them, as opposed to single-use paper towels. A clever way of going green and saving money is to make your own cleaning products at home. Store-bought cleaning solutions are expensive and full of harmful chemicals. You’re sure to find some eco-friendly cleaning product recipes online that you can make at home at a much lower cost. For more DIY ideas that can help you live frugally, lowering your environmental footprint, and saving money, click here! The back of the fridge is often neglected because it’s up against the wall and the fridge is usually placed between cupboards. Many people don’t see the point of cleaning it as long as it’s working fine. If the back of your fridge is dirty it’s probably using more energy to work. This is bad news for the environment, your electricity bill, and the longevity of your fridge. Take the time to clean it every few weeks to ensure that it’s running at the lowest needed power. Insulation will keep the water warm and enable your water heater to work less for that same purpose. The insulation will cost some money during installation but the economic benefit will reflect on your monthly bills, especially during the colder months of the year. It’s hard to understand how regular light bulbs haven’t been completely replaced by LED lights yet. LED lights provide just as much lighting but use a lot less energy. Their lifespan is a lot longer than that of regular light bulbs, too. This is one of the most popular green ways to save money and it’s a mystery that not everyone is using it. For some reason people used to believe that in order for clothes to get clean they need to be washed using hot or warm water. In fact, this misconception still exists to this very day. Luckily, that’s simply not true because clothes can be washed with cold water with the same efficiency. Using cold water will require less energy from your washing machine. This way, you’ll be helping the ecosystem and at the same time doing your electricity bill a huge favor. Having an item of clothing in your washing machine isn’t an indication for you to use it. Depending on the size of your family, only use your washing machine once or twice a week. Any excess usage is a waste of energy. Your washing machine utilizes the same amount of energy whether it’s washing one item of clothing or ten. Wait until it’s full before turning it on. It seems that in the era of technology people are having less and less patience. People these days don’t even have patience to wait for their clothes to dry so are using dryers to speed up the process. Dryers consume a lot of energy – something you are probably aware of yourself if you’ve ever heard one work. In order to cut back on electricity and energy consumption you can buy a drying rack to dry your clothes. It’s not as efficient or as fast, but if you’re looking for green ways to save money, this is one of them. We’ve been successfully brainwashed into thinking that tap water is no good for us and the only water good enough for our bodies is bottled water. Perhaps a lot of credit goes to bottled water companies for having such successful marketing campaigns and convincing so many people. The truth is, however, that bottled water is no better than tap water. Some say tap water might actually be better for us. This plays into what we’re talking about because bottled water is more expensive than tap water, and also causes so much harmful plastic waste. When you’re at home just drink tap water. As for when you’re leaving the house, just purchase a reusable bottle that you can fill with tap water before you go. When thinking of how to save money by going green, this is one of our favorite ways. Picking up fast food on your way home is the easiest thing in the world, but it’s bad for your health, the environment, and your wallet. By cooking at home you’ll be able to eat healthier, which will certainly make you feel better and you’ll be able to save money too. The cost of cooking at home is a lot less than picking up fast food most days of the week. Looking for more ways to get food and save money? Check out our useful guide to getting free food! The more meat you consume the higher your carbon footprint, which is bad for the environment. Eating less meat will also help you save some money on groceries. There’s a third benefit for cutting back on meat and that is your health. Eating a diet high in meat isn’t good for our bodies. Cut back on meat to gain better health, contribute to a better environment, and save some money in the process. You’re likely to find all fruits and vegetables available throughout the entire year regardless of whether or not it’s their season. Nonetheless, purchasing them in their seasons means they’re at their healthiest and they’re likely to be cheaper too. You’ll also be encouraging farmers to grow and harvest these seasonal fruits and veggies. You don’t have to exclusively buy seasonal fruits and vegetables, but it wouldn’t hurt to make them the bulk of your grocery shopping, especially since it’ll help you save money. Plastic bags are some of the most harmful things for our planet. We’ve all seen the amount of plastic and plastic bags that ended up in our oceans. There’s no reason someone would support and actively buy and use these bags since they’re not offering any benefit. You can do yourself and our planet a huge favor by boycotting them once and for all. In order to carry your groceries you can just bring your own bag to the store and pack everything in it. Your impact will be multiplied as people standing behind you in line see you doing this and start following in your footsteps. Hopefully at some point we stop seeing plastic bags altogether and their disastrous consequences on our environment. You don’t need to buy everything you see on TV. Think of all the items you bought and have barely used. Purchasing something new is one of the most exciting things in the world. However, that excitement only lasts 1 or 2 days before it fades away, leaving you with less money and a product you don’t need taking up space. Ultimately, these products will be left plugged in, not used, and end up being thrown away. Either way, you’re harming the planet by using energy or contributing to waste. Before you buy something think about how much you really need it and how often you expect to use it. Earn money by selling your old stuff instead of throwing it away in the trash. You’d be surprised at how many people might be willing to purchase things you want to throw away. Throwing stuff away contributes to polluting the planet, and at the same time you won’t be getting any money for it. One app that can help you sell your old things is Gazelle. It can help you find nearby people in your neighborhood who want to purchase your stuff. Join Gazelle now to sell your stuff instead of throwing it in the trash! Modern society is built on consumption and speed. There’s no time to fix things or repair them, just throw them out and go purchase new ones. This applies to clothes and electronics. Your phone breaks and you think it’s time to buy a new one. No, maybe you should try to fix it first. This limits waste and will obviously save you money. Why buy a new phone for $400 when you can repair your current one for $50? Get a library card and use all of its brilliant facilities, from books to Internet and search engines. Using libraries to check out books to later return them will also limit paper consumption and help save the trees. Install sink water aerators to control flow through your tap. It might not seem like much but when you think of how many times you turn on the tap per day, it’ll add up to a decent amount which will be reflected on your water bill. Similarly, you should use low-flow shower heads for a more controlled flow of water in your shower. Using regular batteries that aren’t rechargeable adds to waste since they’re thrown out the moment they run out of energy. Rechargeable batteries reduce landfill and save money because you won’t have to go out and purchase a bunch of batteries every few months. We’ve listed 25 ways to save money by going green. These are just some of the most popular ideas but if you put in some effort you’ll find plenty more out there. There’s no shortage of green ways to save money, what’s needed is a little enthusiasm to put them to practice. Click here for more money-saving ideas that will help you live more simply and help save the environment at the same time! Do you know any other green ways to save money we might have missed? Share them with us in a comment below!